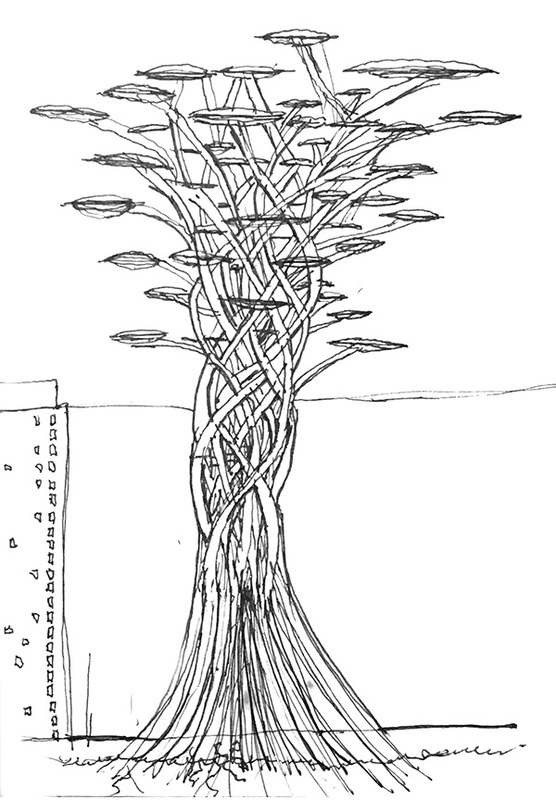 In the Year 2200, artificially organic architecture will begin rooting itself into the urban fabric as living structures to be inhabited and farmed by humans. Building structure is no longer a quick assembly of structural components but a natural process which takes its time to grow and thrive within its community. Create a theoretical skyscraper concept that creates a better future. Consider how your concept can solve greater problems in urban and/or rural environments. Develop drawings, renderings, case studies, and any other documents to validate the concept. Architects have been designing with natural materials in an effort to mimic nature for centuries. But why? It’s time to redefine how structures can truly be organic and living organisms rather than a static descendant of a grown material. The natural environment is wild and grows in a state of chaos while architecture is organized and guided by the human hand. This separation, all too familiar, is something that needs to be changed. If architecture and plant biology can combine to become one then essentially we can live within nature instead of around it. By combining plant DNA with the guidance of technology we could create living structures that create habitable spaces that allow you to live within nature but in an urban context. 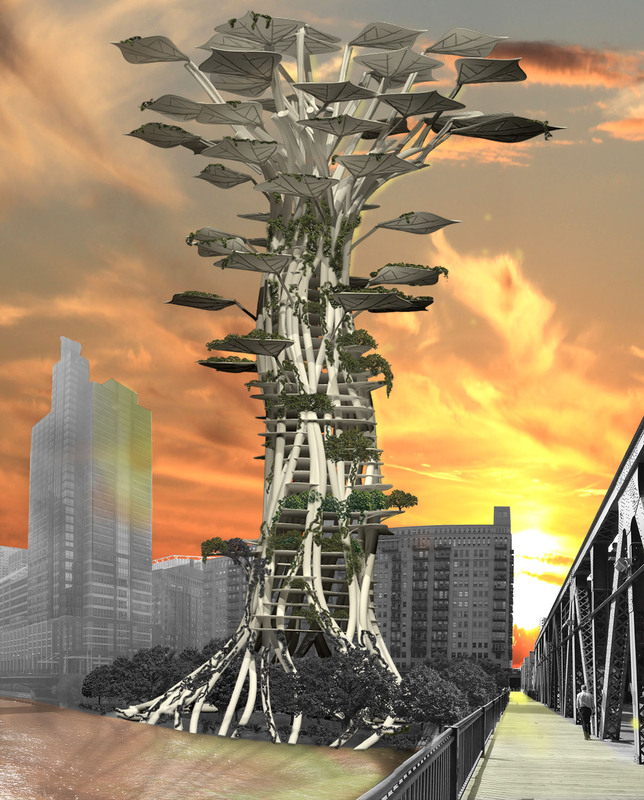 In the year 2200, Artificially Organic Architecture will grow essential living structures to be inhabited by humans and farmed for food and other resources. Building structure is no longer a quick assembly but instead a natural process which takes its time to grow and thrive within its environment. 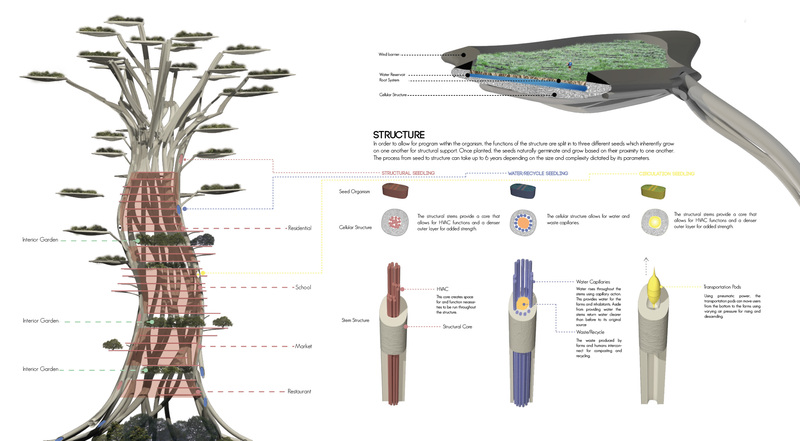 This process begins by combining the knowledge of an architect and a plant geneticist. The architect designs the structure using parameters dictated by the mathematical equations that already exist within nature. Once the architect formulates the design, it is then programmed by a plant geneticist into a seedling organism which carries the genetic coding of natural growth but with the intelligence and structure of a building. These structures can be planted in any environment around the world to create spaces for every function. This example of A.O.A is located in the heart of downtown Chicago where it provides both a natural environment to reside in and farming space for food to be grown locally. The leaf structures are dedicated farms that create nutrient rich soil for planting various vegetation. Similar to trees, the farms are spaced out to allow for maximum sunlight to power both the structure and the plants growing within them. The leaves act as an aerodynamic structural component, creating life to contribute to the structural loads. "67% of the world lacks access to proper nutrition." This concept of A.O.A. was set in an urban fabric due to the constraints of the competition. It was designed to provide access to grow and sustain local produce using a small footprint. However, the evolution of this concept could help relieve areas of the world that are lacking fertile soil or access to farmable land. An explosive hot sauce brand.